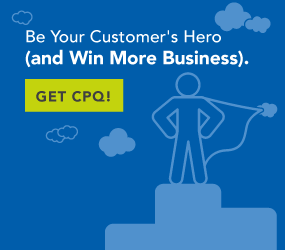 CPQ software enhances the buyer experience and offers a unique opportunity to accelerate the process of turning prospects into buyers. Prospects have needs. Early in a buy cycle these needs are less fully developed and lack specificity. As the buy cycle evolves, the prospect acquires knowledge about their needs and also about possible solutions to mitigate the pain associated with those needs. Ultimately, as that knowledge is acquired, the prospect will begin a selection process related to the solutions offered and become a buyer. At the conclusion of the interview, the product offering is configured based on the specifics provided by the prospect. There is no pushing this or that feature or bundling some unnecessary functionality. The depth of this questioning will build buyer confidence in your ability to help them. The selection process is driven by the quality of knowledge obtained along the journey, which boosts the confidence the buyer has in the source of that knowledge to help them fulfill their needs. Why Is It a Confidence Game? Confidence is key to almost any relationship. Most of that confidence is built around the veracity of the information the parties share in their relationship. If someone is known to be ignorant, deceptive or dishonest, it’s hard to imagine any level of confidence being established between the two parties. I recently needed to hang a heavy mirror in our living room. We live in an older house that has real plaster walls, not drywall, sheetrock or plasterboard over studs. I mean plaster over lathing. I went to the hardware store to inquire about the best type of anchor for hanging heavy objects. The “expert” on the floor listened to my problem and told me that the best solution was to just use a nail. This guy clearly had no clue what real plaster was. His suggestion told me he was clueless and destroyed any confidence I had in his ability to help solve my problem. Imagine how important confidence becomes in a more complex transaction. Complex problems, solutions or products; complicated pricing and competitive markets all elevate the need for establishing prospect confidence early in the transaction and maintaining it throughout the buy cycle and beyond. CPQ software telegraphs a distinct “we are buyer-focused” message to your prospects. This is the foundation that’s needed to build the confidence in the prospect’s mind that you offer valuable knowledge and viable solutions to their problems. Let’s take a look at how CPQ software drives this process. CPQ software ensures that your solution configuration is tightly aligned with prospect needs. CPQ software features a scripted interview process. This is an interactive, response-driven, question-and-answer process that allows the prospect to fully describe the nature of their needs. General, high-level questions on the front end give way to more-specific technical questions later in the process with each answer provided driving a new set of questions to be answered. CPQ software ensures that quoted pricing matches value provided. By tailoring the solution offered to tightly conform to the needs of the buyer, the buyer is provided with highly transparent pricing that eliminates the potential “hidden fee” or unnecessary charge. Each feature is tied to a specific need and can be presented as a separate line item. The buyer can be confident that the price quoted is understandable and explainable. CPQ software provides quotations that give the prospect “what if” flexibility. CPQ software generates fully itemized bills of material with associated line-item pricing. This allows prospects to prioritize needs and wants to conform with their own budgetary limitations. Nice-to-have features can be isolated from essential features in various combinations. The prospect can select a solution for the current acquisition with the assurance that additional functionality can be added at a later date. This eliminates the often budget-busting, all-or-nothing choice that makes your offering more desirable from a competitive aspect. When you offer access to CPQ software earlier in the buy cycle, it gives the prospect a risk-free tool to explore their own needs as well as your solution. This is how buyer confidence is built. The nature of the buying transaction has changed so much. Buyers delay talking to sales agents further and further into the buy cycle, and it’s estimated that buying decisions are 70% complete by the time a one-on-one interaction takes place. Availing your prospect with early access to CPQ software within your sales portal or website is a sure way to start building a high-confidence relationship with the prospect early on. Regardless, if you are using CPQ to enhance an online buying experience or empowering your sales force with mobile CPQ software, the prospect will benefit from the assurance of solution alignment, pricing integrity and budgetary flexibility. CPQ software builds confidence—confidence that you are the right partner, your solution is the best solution and that a relationship with your company will be the most beneficial to the buyer over many, many years.